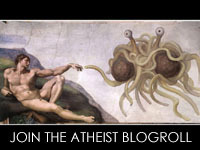 I’m joining Mojoey‘s Atheist Blogroll, despite my own waffling on that particular term (I’m leaning toward “agnostic atheist” these days). I made my own whimsical logo for it, but Blogger’s being nasty about letting me use it, so I hope actually posting it will do some good. Here ’tis, taken from this image, stolen from here.